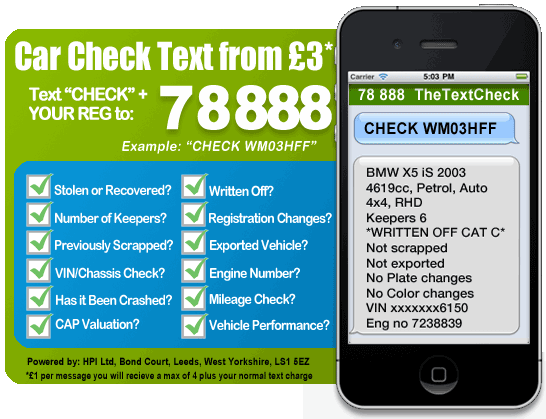 HPI Check by Text – Used Car Data on your Phone for only £3: Simply Text ‘CHECK‘ plus the car’s reg number to 78888. Its simple, fast and effective. 1 in 3 used cars has a hidden history, don’t run the risk – TheTextCheck.com has you covered. 1 in 3 used cars has something to hide – That shiny dream car or bike could be stolen, cloned, clocked, subject to outstanding finance or even written off, seen by insurers as too badly damaged to be repaired safely or economically. It’s not just your money that’s at risk, your life could be too. No matter how tempting the vehicle appears, be safe with a HPI check to make sure there are no nasty surprises in store. Be sure that used car or bike you have your eye on is all it makes out to be. Our HPI style text check will tell you whether it’s stolen or recovered, scrapped, written off, exported as well as providing useful ino such as number of previous keepers, VIN/chassis number, whether it’s subject to outstanding finance, any registration number changes, engine number details and mileage history. Be covered and make sure the next used car or bike you buy isn’t stolen or written off as a Cat D or Cat C and possibly not be road worthy. With outstanding finance information provided by Experian, the UK´s largest and most established credit reference agency, you can rest assured that you buy the vehicle of your dreams – not of your nightmares. 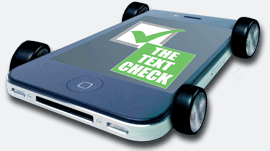 Getting the lowdown on any car or bike couldn’t be easier, or faster, thanks to TheTextCheck.com. A quick text and you can have a whole host of details about any vehicle straight away. Homework – you may have thought you left that behind in school, but when it comes to buying a used car or motorbike, it’s every bit as essential to ensure you don’t get ripped off. My Text Check – What Does It Provide? It only costs £3 and takes a matter of minutes, but what exactly do you get when you carry out a vehicle check with TheTextCheck.com? Well here’s the lowdown on the sort of information you can expect to receive about the car you are interested in. How many texts do you think you send in a day from your mobile phone? It could be a dozen, may be even ten times that for some people. Well, what if just one of those texts could save you thousands of pounds or maybe even more? TheTextCheck is very useful, you get a high quality service in an instant. I was very happy with the service and got everything I needed to make a quick and timely purchase of my new car.